Remember how the offseason free-agent market was pretty boring? That hasn’t been the case with the weeks leading up to the July 31 non-waiver trade deadline. 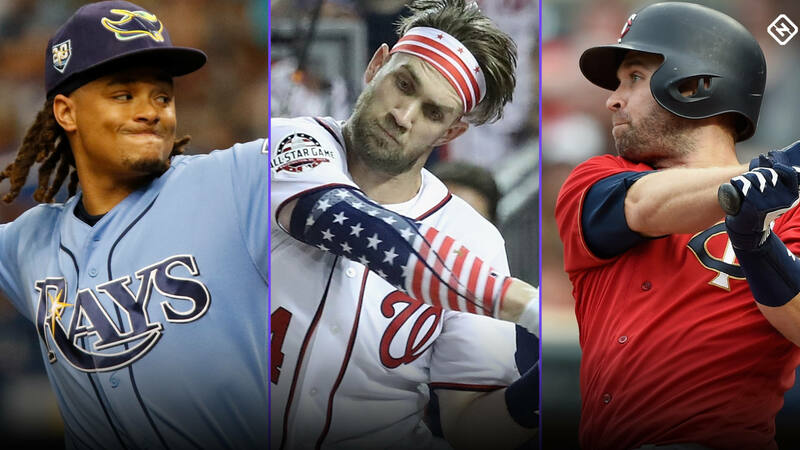 Deals have been done — since we first published this list on Friday, several players have been traded, including Asdrubal Cabrera, Mike Moustakas, Ryan Pressley and Brad Brach, to name a few — and more are on the way. This is the time of the year when we constantly refresh Twitter looking for news of who’s next to be traded. So we thought we’d help answer that question by ranking the players who could be dealt next. And because it’s impossible to lump everyone into one list, we broke them down into different rankings. Think of them as hybrids of the “best player available” lists you’ll see during draft coverage. The guys near the top of the list aren’t necessarily the absolute best talents who could possibly be moved, but they’re guys who have great talent and are more likely to get moved. Check back often. We’ll keep this updated as trades happen and rumors change. Thoughts: The veteran right-hander’s first couple months of 2018 were rough, no doubt; he owned a 7.88 ERA after his outing on June 1. Since then, though? He’s been outstanding. In his past 28 appearances, he’s allowed only two runs — both on solo homers — and owns a minuscule 0.64 ERA in 28 innings, with only 14 hits allowed. Thoughts: This hasn’t been his finest season, but Dozier has averaged 35 home runs in the past three seasons, and he’s been a bit better lately, with an .776 OPS with 21 RBIs in 25 games in July. And remember, Dozier was much, much better in the second half last year, posting a .985 OPS and popping 21 homers after the All-Star break. He makes a lot of sense for the Brewers. Thoughts: Harvey has made five starts in July. On one hand, he’s allowed two or fewer earned runs in four of those five starts. On the other hand, he allowed eight earned — and four homers — in that other start, and he hasn’t made it six full innings this month. He will be traded, but he’s not going to bring back a big return. Thoughts: In his first year as the Rangers’ closer, Kela has saved 24 of 25 opportunities and has a better FIP (2.97) than ERA (3.44). Contenders probably won’t trade for him to be the ninth-inning guy this year, but he would be a big upgrade to just about any playoff bullpen. He’s under club control through the end of 2021, which means two things: 1. The prospect price to land him won’t be cheap. 2. Teams are more willing to pay higher prices for years of control. As with all the relievers on this list, there are plenty of potential landing spots. Thoughts: Opposing hitters have almost twice as many strikeouts (51) as hits (26) off Barraclough in 46 innings this season. He hits arbitration for the first time this offseason and isn’t eligible to become a free agent until after the 2021 season. Thoughts: To get Gibson, a team would have to willingly overpay at this point. In his most recent outing, Gibson went eight innings, striking out seven and allowing just four hits and one run IN FENWAY PARK. Yeah, that was impressive. He’s under club control for one more year, then is eligible to become a free agent after the 2019 season. Thoughts: Feels like Archer’s been mentioned in trade talks from the moment he arrived in the majors. His ERA is a touch high (4.31), but his FIP (3.62) is right in line with his career number (3.48) and he struck out 13 batters in a recent start. His contract includes team options for 2020 and 2021. Thoughts: Realmuto just might be the best catcher in baseball, and he’s under club control through 2020. Any trade offer would have to start with an elite prospect and include at least a couple of more above-average youngsters, too. If the Nationals consider themselves contenders, Realmuto is a perfect fit for this club in 2018 (and the next two years, too). Thoughts: We’ve talked about the idea of trading deGrom. Yes, it would be expensive. But if you’re already a legit playoff contender and you KNOW how difficult it is to win games in the postseason, wouldn’t you do whatever you could to trade for a true ace like deGrom, knowing you would have him for at least the next three Octobers?